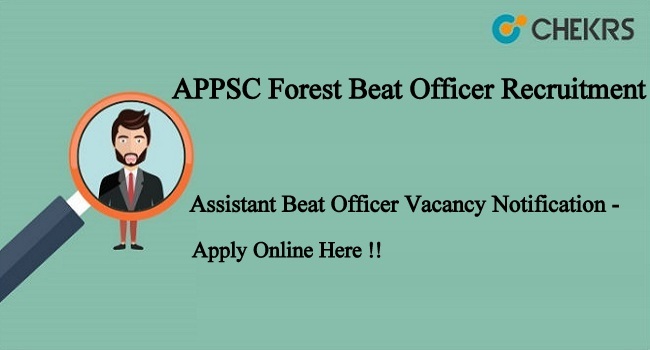 APPSC Forest Beat Officer Recruitment 2019: Andhra Pradesh Public Service Commission (APPSC) has released the recruitment notification for 430 Posts of Forest Beat Officer, Assistant Beat Officer. The APPSC Assistant Beat Officer Notification 2019 pdf has published on the official website and download link provided below. Eligible & interested aspirants can check the Andhra Pradesh FBO Vacancy 2019 & fill the online application form through the official website on or before the last date. The APPSC ABO application form available from 05th March to 27th March 2019. Candidates before applying the APPSC jobs can download the advertisement pdf and check the eligibility details. The APPSC Forest Beat Officer Selection 2019 process is a basis of prelims exam, mains exam and interview. Applicants can check the age limit, education qualification, post wise vacancy, application dates, selection process, application procedure, salary structure, and other details in the below article. Aspirants who want to apply for Andhra Pradesh Forest Departement jobs all need to confirm their eligibility and fill the online application form on or before the last date through the APPSC official website. Take a copy of the APPSC FBO ABO application for further preferences. Aspirants who applied the application form before the last date those can get the exam hall ticket. The APPSC Asst Beat Officer Exam Admit Card 2019 will release on the official website. Applicants by using the application number & password can download the exam hall ticket from the APPSC official website. APPSC is going to conduct the screening test (Prelims) on 26th May 2019 & Mains exams in the month of August 2019. Aspirants will get the admit card 10 to 15 days before the written examination. The Andhra Pradesh PSC authorities will not send the exam hall ticket hard copy by post or email. APPSC prelims exam Admit Card is an important document for entering the examination center as without it the aspirants will not be allowed to enter the exam hall. The examination result of the APPSC Forest Beat Officer will publish on the official website. Candidates who attended the exam are waiting for the release date APPSC FBO Exam Result 2019. Aspirants will get the exam result within two months of examination. Applicants by using the hall ticket number & password can check the exam result. Applicants who will satisfy the APPSC ABO Prelims Cutoff Mark 2019 will shortlist for the Mains examination. Remarks: For more details of APPSC ABO FBO Recruitment 2019 can check official notification pdf. Any doubts regarding the APPSC forest department notification you can discuss with us in the comment box.